Everyone seems to be looking for the fastest, easiest (and cheapest) way to learn guitar when we all know that anything worth learning requires a substantial investment of your time, and perhaps a little money. If you’re a regular reader of this blog, you’ll know that I’m not a purveyor of silver bullet short-cuts to guitar greatness. I’ll leave that to YouTube. However, there are ways you accelerate your learning that are quite universal in that you could apply them to almost anything else. They also happen to spell out the word FAST. If you’re going to learn something new, forget what you already think you know. This isn’t a problem with kids as they are naturally curious but with adults their ego gets in the way for many reasons: they think what they’re learning is too basic, they think they already know because they learned it at school some decades ago, they have preconceived ideas about the way something is that’s blocking them from seeing the way it actually is… and the list goes on. You see what I’m saying. So, I’d suggest a clean slate when it comes to tackling something new on the guitar. When you learn a new concept on guitar, whether it’s from a book or a video, the new knowledge needs to pass through a couple critical stages. The first is grasping or understanding the concept and perhaps playing an example, which should then lead to reflection. The reflection stage is often omitted as many players think that understanding a concept and being able to play an example of it technically equates to learning. More often than not, it doesn’t. When you reflect on a concept, you begin to adapt it to your playing and see how you could incorporate it into whatever you do on guitar. This in turn leads to action which means using the new information in a creative or meaningful way. This doesn’t have to be complicated, and if you all you know are 3 chords, make up a 3-chord song! If it’s a new scale, write a riff or come up with some licks to make it yours. It’s no secret that when you’re excited by something or experience an emotionally-charged situation, there’s a pretty good chance you’re going to remember that thing for a long time afterwards. This is also true of learning guitar. If you’re not emotionally involved in whatever you’re currently learning, chances are you won’t commit much of it to your long-term memory, and if information doesn’t reach your long-term memory, it won’t become second nature. 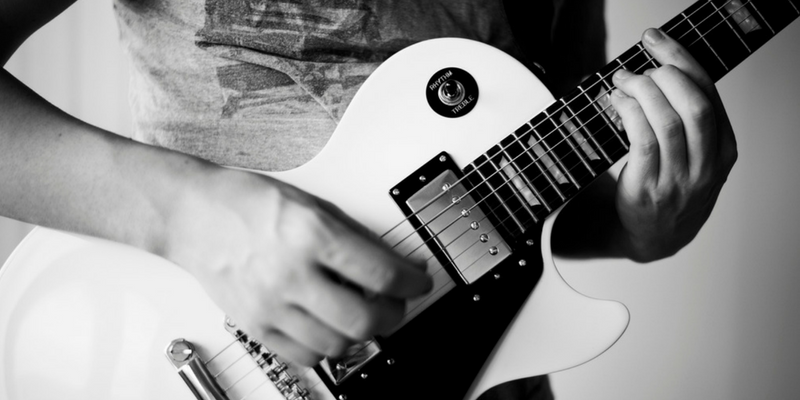 Most guitarists can usually remember the first few songs or riffs they learned on guitar; not because they were easy, but because of the excitement they generated. Learning to play ‘Are You Gonna Go My Way’ or ‘Rock and Roll’ were milestones for me and I can still play them from memory over 20 years later. Sometimes it’s hard to make the boring stuff like scales interesting but that can also depend on the method you use. I created the 2 Position Guitar Scale System as a way to get excited about scales and have a constant sense of progression and learning that I could apply right away. If you can, teach what you’ve learned to someone else, or at least share it in a meaningful way. You don’t have to be a teacher to do this because just thinking about how you would explain something to someone else will give a new perspective on it. Teaching is like learning something two or more times over. Every time you teach something to someone else, you deepen your own knowledge. This is how I was able to come up with several different perspectives and methods on learning to improvise. Hacking the CAGED System is for those that want a complete system for scales, arpeggios, chords, modes and keys. From Scales to Solos is for those who want to turn the scales they know into music. No Theory Guitar Soloing is a system for those that just want to learn a couple of patterns and play. Beyond Pentatonics is for those that want to build on their knowledge of pentatonics and explore modes. Melodic Soloing in 10 Days is for those that want a melodic approach to improvising based on intervals. If you can apply these four principles to learning guitar, or anything else for that matter, I guarantee you’ll get there faster. Good stuff. For me that A is for APPLICATION; it just sticks with me better. TEACHING does indeed work as I can attest from computer programming to martial arts. Thanks for the this insight.